Fairyland and The Mackem Bullet fought out a terrific duel in the final furlong with Brian Ellison’s 25-1 outsider The Mackem Bullet looking as though she might just win the battle. However, the Aidan O’Brien-trained Fairyland, who had been up front throughout battled on bravely for Ryan Moore and got the verdict by a nose. Queen Jo Jo was two lengths away in third place. The disappointment of the Group Two heat was Angel’s Hideaway, who faded out of contention after being short of room when the race hotted up in the final quarter-mile. 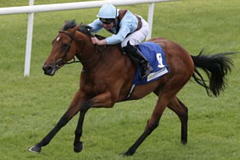 O’Brien said: “We were very happy with her at Ascot (third in Albany Stakes), but she was under the weather in between. “I’m delighted with her. She did get headed so it was great to see her battle back. Ryan said she had a blow two (furlongs) out, which was understandable. “She’s a lovely filly and that (Cheveley Park) is the way we’ll be heading. O’Brien also commented further on the virus that has afflicted his yard in recent weeks. He said: “It was in all of our three yards. It was as bad as we’ve had at Ballydoyle. Ellison said of his gallant filly: “He (Ben Robinson) gave her a great ride, I’m delighted. “She definitely got to the front and then just got nabbed on the line. After the line she was back in front. “We came here a big price today and she shouldn’t have been after her Ascot run. She’s improved again. “We actually sold her after Ascot to go to America, she passed the vet and I stopped training her for a week, but then they pulled out of the sale.